Face it Linux users—if Microsoft Office, Photoshop, and other popular applications were available for your platform, your club would be a lot less exclusive. No disrespect to the Linux development community, which does some stellar work, but that’s the cold, hard truth in the consumer space. That’s also why the Ubuntu Linux (64-bit) release of a top-tier music creation application by the name of Bitwig Studio is huge news and a possible harbinger. It will also ship for Windows and OS X—Bitwig isn’t crazy. Bitwig Studio (think Ludwig, as in Beethoven) is what’s known in the musical community as a DAW, or digital audio workstation. Think of it as Garage Band, with a lot more features and capabilities—a lot more. Like Apple’s Logic, but more cutting edge in design and slanted towards live performance and electronic music. Ableton Live is the more apt comparison. Suffice it to say that the program has been highly anticipated. On the other hand, Linux users aren’t used to paying heavily for software. Bitwig Studio is $400—as in $400 more than the OS. However, that buys you three licenses, meaning you could run Bitwig Studio on Windows, OS X, and Linux at the same time if you so desired. Many musicians, even if they buy it for the other two operating systems, will take a shot at Linux just to see what’s up. As the operating system has come a long way in the last decade, I imagine the uninitiated will be pleasantly surprised. "Many musicians, even if they buy it for the other two operating systems, will take a shot at Linux just to see what’s up." The one true issue they’ll face with Linux isn’t the OS, or the worth of the application, but the lack of popular third-party virtual instruments and effects. Bitwig Studio provides plenty of its own, plus a ton of samples (wave files of instruments, beats, and music) which are more than enough for most creative purposes. But if you’ve already invested heavily in third-party plug-ins, the lack of Linux versions will be a non-starter. 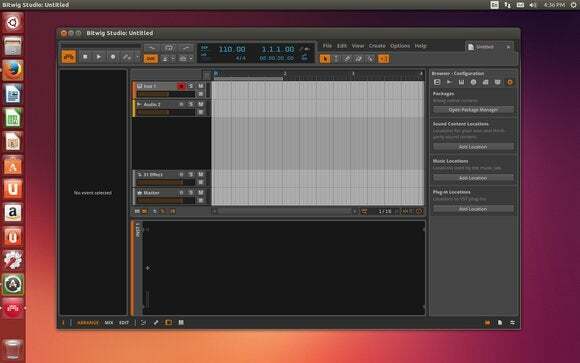 Bitwig Studio supports Linux plug-in types, but hopes that the program’s presence on on the platform, as well as that of other music apps such as EnergyXT will spur VST developers to port their products. Let us hope. Of course, I wouldn’t have written this article without kicking the tires to confirm the Bitwig hype. Having used just about every DAW in existence, when I say I was impressed, I’m not blowing smoke. I was especially fond of the look, which is clean and appealing, and the paned interface (no stack of windows). Bitwig Studio is complex with a host of features, but you can hide the stuff you don’t need or aren’t currently using. This makes it a focused tool for creating, recording, and live performance. All that said, there is a bit of a learning curve and one can always nit-pick as DAW aficionados are want to do. There are quite a few bugs as well. Overall though, Bitwig Studio is wearing big boy pants and its competitors should be worried. It’s also completely modular and the company will be exposing the back-end at some point in the near future—a carrot for gear-head types. Because Bitwig is an application that’s sure to attract a lot of musicians, who have a disproportional influence extending far beyond the musical community, it’s news. If Bitwig leads musicians to try Linux, they’ll lead others, and that can’t be a bad thing for everybody’s favorite free OS. Now if only the plug-in vendors see it that way. Only time will tell, but there’s something in the air. We normally don't list dot upgrades, but Bitwig has acquired so many new features such as time signatures, better timeline navigation, a reworked multii-sampler and others, that it's a far more versatile and viable DAW for power users than it was even last year. Another half star for the company's efforts. If you're into sound design, Bitwig will have special appeal. A plethora of modulators can be applied to nearly anything, and the program even provides CV/Gate output for the patch-cable synth crowd. Designed along the lines of the clip-launching Ableton Live, Bitwig has a more attractive, fully scalable interface. Workflow is very good, though version 2 backslid in the regard in an attempt to more readily support Microsoft's Surface PCs. Bitwig is the only DAW to support both 32-bit and 64-bit VSTs, but there are oddities and omissions in the traditional recording and mixing roles, so kick the tires thoroughly. But kick the tires of this largely brilliant yet occasionally perplexing program, you should.